we have been making and publishing it’s own titles on the App Stores now with increasing success and we have now decided to branch out and develop a publishing program! The first title under Nitromes publishing wing will be 'Ultimate Briefcase'. It is being developed by a very talented developer named Stefan Åhlin and his new studio ‘Quite Fresh’. Stefan actually worked at Nitrome in the past on many of our hit web games before leaving to pursue other things. We remained in contact since then and were thrilled to see us be able to team up again! In 'Ultimate Briefcase' your tasked with surviving an onslaught of bombs with nothing to protect you but your trusty briefcase. There are many bomb types and power ups for you to discover in the game. You collect currency along the way which can be used to unlock new characters and level up the briefcase and those characters special items. During the game you will also be able to unlock new areas each with its own distinctive gameplay quirks. Ultimate Briefcase will be coming to iOS and Android devices soon! The Nitrome publishing program is different from other Publishing programs in that we seek to focus around the developers themselves rather than individual titles. For us it’s about finding the right people than cherry picking each game and working with those people to bring multiple titles to the App stores. Our hope is to enable developers to spend more time creating great content and less time on worrying who they might find to publish their next game. We will work with developers from early in the process to ensure that their future titles will be something we are happy to publish and that they will be profitable enough for the developer that they can continue to make more great games. Nitrome published games will remain to be pixel art based, focused around a core query idea and funded by monetization models that fit our moral compass. Any talented indies interested in a potential partnership feel free to contact us at publishing@nitrome.com. For those that are currious as to what this means for our in house developed content....not much. We intend to keep producing the same ammount of content in house as we were before and in fact are expanding the team to be able to produce more content in the future. For those of you wondering if the published games will appear on the website: Were considering this on a game by game basis. Primarally we are offering publishing based on mobile however we are open to the game appearing on the website aswell if the game is made in a technology that is compatable and if the developer wishes to pursue that. Currently there are no plans for Unltimate Briefcase to come to the website as the focus is on getting the game onto iOS and Android. It is possible however and if the developer shows an interest this may change. Todays pixelove is Birdy fruit by the talented pixelpushing team Fliptic. It's a relatively simple concept in which you must flap your avian friends wings to guide him to safety. The catch is that you only have control of the altitude but not the direction making the game a whole lot trickier. oh yeah and theres a whole buch of traps, enemies and fruit in there too! Beneath the lighthouse has lots of cool features that work with the touch and rotate mechanic icluding the rather cool SPONGES!. As you can see the sponges react to the players touch making them inflate when your finger or mouse is pressed down. Check back for lots more gaming news next week. What nicer way to round off the week with another cool little teaser of our next game Beneath the Lighthouse! 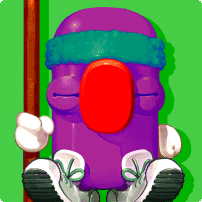 As you can see it's a little reminiscent of our old classic Roly Poly and Ditto combined. This time though we have really went to town on the game and taken the game to brand new heights. We really are super pleased with how this one is turning out, so expect lots of news on some of the cool new mechanics and traps soon. Until then happy gaming and have a great weekend. 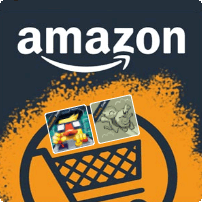 Great news, Nitrome is part of Amazons new gaming service Amazon Underground - "what's that?" I hear you say! Well in a nutshell it's a brand new gaming service that lets players download games (many of them pay for titles or Freemium with nasty pestering In App purchases) for FREE! with absolutely no catches whatsoever. We got on board with the launch of this service and at this very moment you can get Gunbrick and 8Bit Doves at zero cost. All you need is an Android phone and the Amazon Underground App! There is more info via the link provided where you can download the Underground App via your Android devices or FireHD and Fire HDX Tablets. 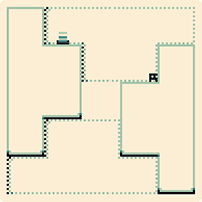 We have just released a brand new Pixelove called Through by Goshki (Originally made for the #gbjam4 competition). What may appear at first to be a simple platformer soon becomes something entirely different (after the first few tutorial levels that is!). Levels are literally flipped around on there heads as you discover you can 'push' through walls, thus allowing you to traverse unexplored platforms. The graphics on this one may be simple, but we are a sucker for a interesting mechanic making this a worthy addition to our Pixelove series. Apologies for missing the usual pixelove Mondays guys and gals. It was a Bank holiday (public holiday) here in the UK yesterday. Some of you may be aware that we are still without a web developer at the moment, which increases everyone's workload a fair bit (*sob*). Well we are still looking and are hopeful that we will find the right candidate for the role given time. Until then please bear with us on the lack of website updates. We are aware that some of you are a little bit fruistrated with the lack of web releases but we are really trying our very best. We are however as busy as ever (currently working on 4 games and a game update!) and are dying to show you what we've been working on. Keep your eyes peeled for our upcoming game Beneith the lighthouse aswell as a slight (well quite big) change of plan for one of our other releases. Check out this second teaser for our next game to be released 'Beneath the Lighthouse' Coming soon to iOS, Android and the Web. 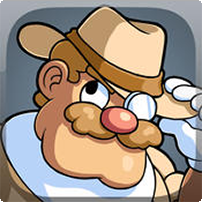 This weeks pixellove game is Duke Dashington by the extremely talented Jussi Simpanen over at Adventure islands. Join our eentrapped explorer Duke in his quest through trap filled Temples. You have 10 seconds to escape each room and only your reflexes and dashing ability to save you from impending doom. We'll... What are you waiting for get to work old bean, Tally-Ho!!! p.s I've still been trying to wrap my head around how the Pixelove backend works for uploading, apologies again for the slight delay. p.p.s If you like this game then show your support to the dev and download the full title on your mobile! We’ve been working on a new game that will be called Go Pogo. 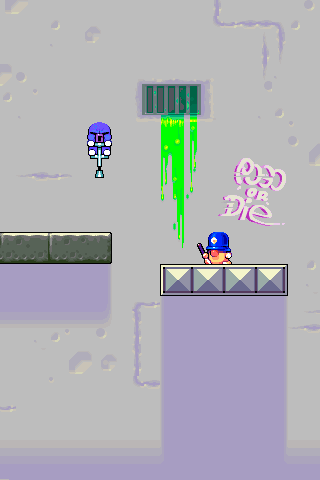 Here is a screenshot, as you can see it revolves around a pogo stick jumping mechanic. We’ve used our old Flash game, Ribbit as a reference, and although we didn’t think Ribbit was the most striking or popular of our games, it appeared to be a good fit for a game to expand and revisit for a touch screen interface. Go Pogo will be level based, but we are planning to have some unexpected game modes thrown into the mix. On a side note, we’ve noticed a pogo game that came out on the app store last week: Zombie’s Got a Pogo. As expected from the title and mechanic, some similarities came to our attention. Hey this happens, we can’t consistently get unique ideas that no one else has thought of before, or around the same time. We’re loving the progress and feel of Go Pogo and to be honest we like a few things that the other game has done, however our game plays different and reassures us that we are on an awesome path! 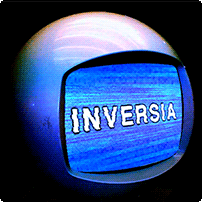 Today's (we'll cough cough... yesterdays) Pixel love is called Inversia by Gabriel Robertson. You are a lone guy trapped in an alien hostile environment. Your captors, a strange alien race label you as a living weapon! Using your new found special abilities of gravity control you must try to escape your tormentors. This game may remind some of you of the rather famous indie title VVVVV. Although it has the same mechanic there is much to like about the world atmosphere and new traps in Inversia. Tight controls have been nailed and we are sure that you'll have a lot of fun with it. As ever if you have any suggestions of games you love and would like to see feature on our pixellove site then please let us know in the comments below. 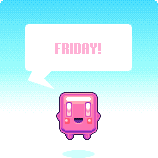 Phew it's been a long week here at Nitrome HQ. Some of our more keen eyed followers may have noticed that we have missed the last few Pixelove game releases. To fill you in on the unfortunate situation we are still looking for a somebody to fill in our web role at Nitrome. This has led to a slip in all things website related whilst we try to absorb the weekly tasks into our own. Through no fault of any party there has been a change of plan and we are now looking for a new web developer. 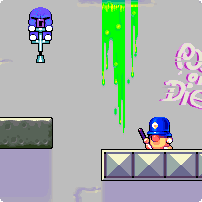 This weeks (rather late) Pixelove game is Tough Love Machine by Andrew Morrish. You take control of a long armed gloved machine and try to connect the two hearts on each stage. The neat sound, bright zingy retro graphics and head scratching puzzles makes this a fine addition to our pixelove catalogue. As ever any suggestions on any Pixelove games you would like to see featured then please let us know. Check out the first teaser for our nextgame 'Beneath The Lighthouse'. "The lighthouse hasn't been active for a while. I wonder what's happened to Grandpa... I hope he's okay?" The game will be coming to mobile and the web. We heard a few of you mention the fact that they missed Friday updates and we realised that it has been AGES since we posted one so... Time for a weekly roundup! You all should have noticed our big mobile release this week Vault! We are really pleased with how it turned out and it seems that most of you did too (phew!) We would love to hear all of you High-scores and your thoughts on all the weird unlockable characters. We have of-course been working on some other games including our level base game Plod and project Jump which are in mid development. However next week we are going to reveal a preview of something brand new and totally awesome. Most of our keen eyed followers will already know that our new game Vault is OUT NOW on mobile! If you like the game then please feel free to spread the word and leave us a nice review or rating! We realise there are a handful of you waiting patiently for us to release Green Ninja and now Vault on the website. We are still having some teething problems that we need to iron out, but the "plan" is to be releasing games at roughly the same time across web and mobile. Apologies for this, hopefully it'll be worth the wait. We'll be giving more news on our latest games in dev soon, but until then, GAME ON! 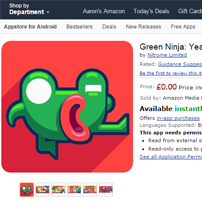 Today Green Ninja has been released on the Amazon App Store. Click Here Now To Download! We hope you can help save the frog from the evil clutches of the Ninjas. Oh and before I forget did we mention that Vault! will also be live tomorrow.